I recently downloaded and used version 4.9 on my map. Now it returns the error "game was not found" when I try to host with it. I'm using the JNGP. My unprotected map can be hosted, and I tested it in single player many times. I tried using the common.j and blizzard.j files in the JNGP and it still does nothing. Also it would be nice if Vexorian could include dates of each update. Last edited by ClichesAreSt00pid : 08-05-2010 at 09:16 PM. 5 days without 1 reply. Anybody? Can someone link me to version 4.7 or 4.8 so I can see if it's just 4.9 causing the issue? Try this on your optimized map. Can't use either when you check "shorten names". Let this be a warning to people, a suggestion if someone has the resources to update this thing, and a tip to just use the .execute() JassHelper built-in and the UNIT_TYPE_DEAD crap. Last edited by Bribe : 01-31-2011 at 07:43 AM. Well, actually, anything with native in front of it should not have its name changed... the fact that the optimizer changes those names is a bug =/=. There are other useful natives besides UnitAlive. Furthermore, the optimizer is incompatible with tools like EMS. Shortening names of regular function calls and variables are kind of important as it helps maps run quite a bit faster. Another problem arises from shortening variable names, namely the TriggerRegisterVariableEvent native. At the moment, shortening names on the optimizer is unsafe to use. There are certainly ways to fix most of these problems (looking for strings that are equal to function names and seeing if they are ever used in an ExecuteFunc as well as looking for strings that are equal to variable names and seeing if they are ever used in TriggerRegisterVariableEvent as well as seeing if something is a function or a native). There is no good way to fix EMS w/o making the name changing portion of the optimizer a part of vjass and having a flag that makes it so a function is never shortened. Last edited by Nestharus : 03-01-2011 at 06:06 PM. I try to enqueue this tool in a building sequence and since compiling and everything takes time, I would like to run it minimized to be able to work/do other things meanwhile without being interrupted by popping windows. My issue is that if you run the program via command line minimized on winXP (start /min VXJWTSOPT.exe), it does not seem to start processing the map until I maximize it for at least a brief moment. 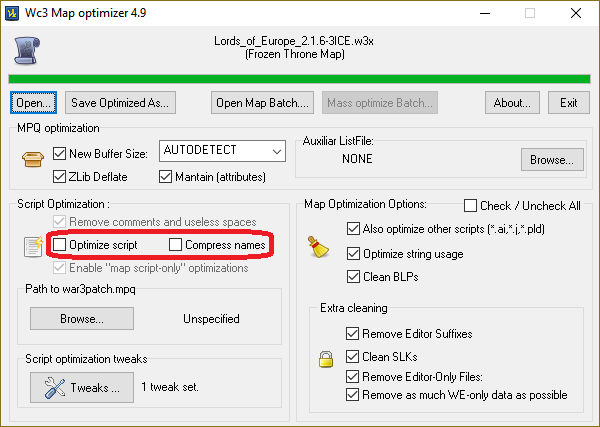 Version 1.29/1.30 of Warcraft 3 broke script optimization in Vexorian's Map Optimizer. Because there is no more war3patch.mpq file. I'll create an mpq file (tiny war3patch.mpq) with the required common.j & Blizzard.j files inside, to make the Optimizer work with scripts again. Edit 2: Noticed your post above me, hi! It pops up for a split second and instantly disappears. Last edited by 3ICE : 09-14-2018 at 10:23 PM.